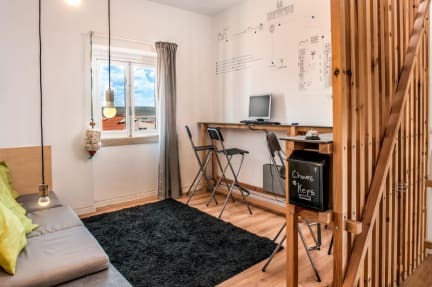 Nazaré Hostel i Nazare, Portugal: Reservér nu! For groups 0-12, 12-18, 18-21 we may request a damage deposite. The hostel offers double rooms with see and mountain view, family rooms and single bed in mixed dormitory rooms. Guests are free to relax in the shared lounge and library, and use the communal kit kitchen facilities. 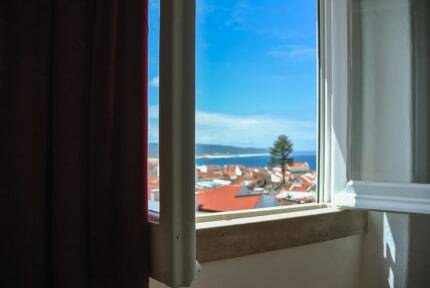 Nazaré Hostel features modern decoration and wood furniture inspired on the local beach tents. Located in the upper part of the village just meters from the beach, benefits from a nice view over the sea. The view of sea&roofs from the window is fantastic and the other parts of the building are very accurate too over the mountain. The beach and center of Nazaré was a variety of restaurants and cafes. You can also walk along the beach on a large sidewalk.